We love salmon, my kids could finish off an entire 15 lbs filet themselves! 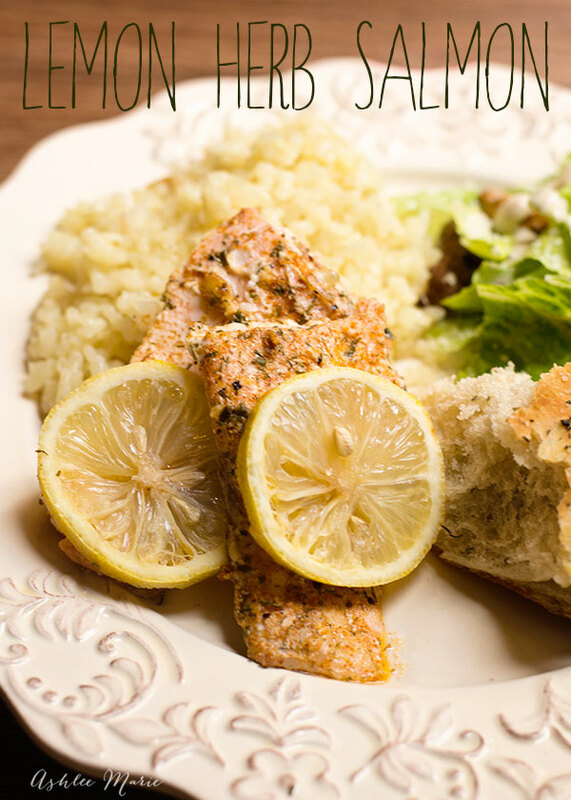 We have a few different ways we like to cook it, but this lemon herb salmon is far and away our favorite! 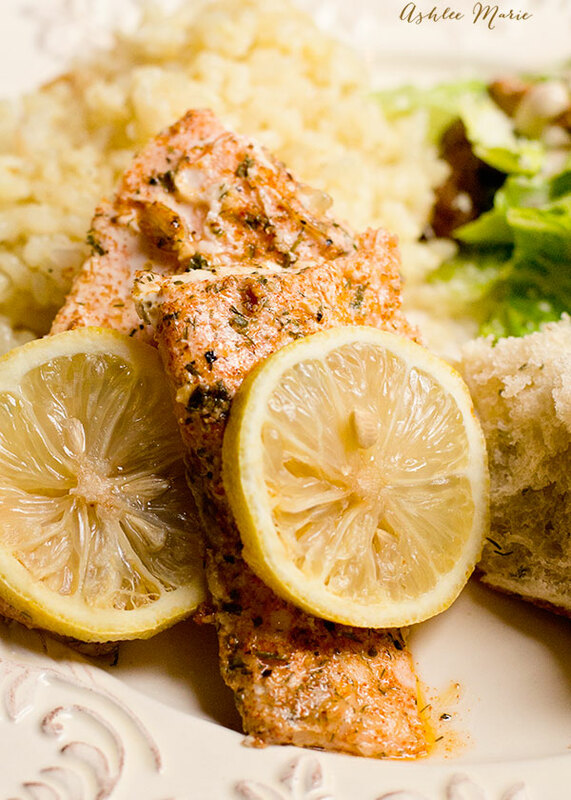 Do you have a favorite way to make salmon? The trick to all fish is not to over cook it. There are a few different rules people use. 10 mins for each inch (so a 2 inch thick filet will cook for 20 mins) or 15 mins per lbs (so 30 mins for 2 lbs). The filets we get at Costco are a bit harder because the tail is so much thinner. Usually I cook it long enough to cook the tail, put it out for the kids, then throw it in for a bit longer and save the thicker side for my husband and I! mix the garlic, salt, pepper and herbs together. lay down foil on a cookie sheet, and place sliced lemons on top. Clean the salmon in cold water, pat dry with a paper towel. rub the butter all over both sides then spread the herb mixture evenly on both sides(but not too much). 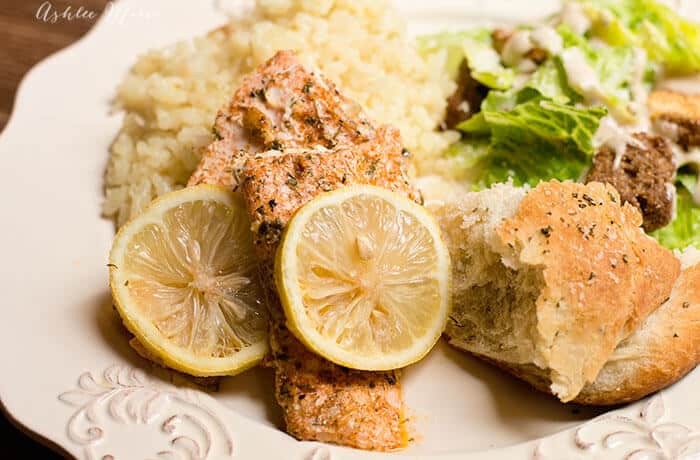 Place the salmon on the lemons, then cover it with the rest of the lemons. place another piece of foil on top and seal the foil together. bake for 10 mins for each inch (so a 2 inch thick filet will cook for 20 mins) or 15 mins per lbs (so 30 mins for 2 lbs). 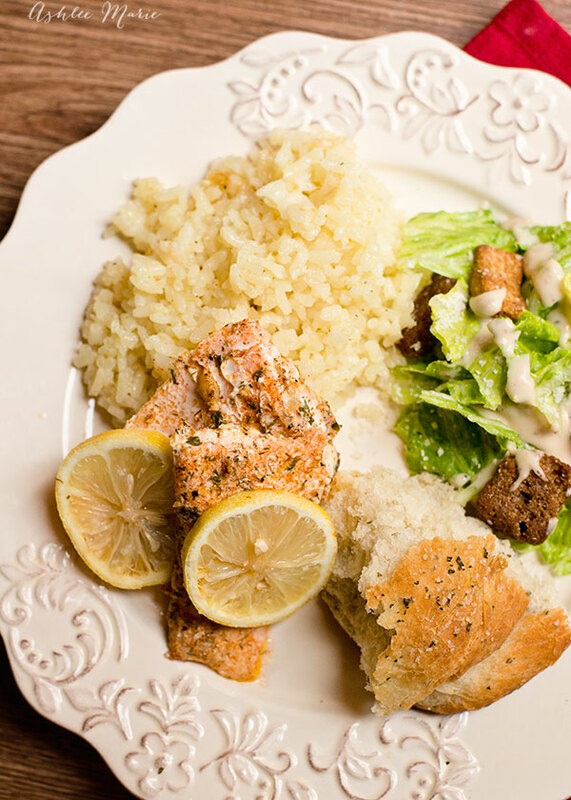 We like to serve ours with my parmesan rice, but there are tons of sides that are great with fish! Roasted potatoes are already great too, Do you have a favorite side with Salmon you like to serve? My husband requested salmon for dinner this week, so we bought a filet at Costco on Friday. I had no idea how I wanted to cook it…I think I’ll definitely try this! I always get mine at costco. if you don’t think you’ll eat the whole thing cut it in half and only cook half, they don’t make good leftovers! This has become a weekly meal in my house! Have not found a salmon recipe I like more, thank you for sharing! I love hearing that! We seriously make it all the time too! I couldn’t get a better compliment, ever, so thank you thank you!